David originally came to Israel to explore and expand his spiritual heritage. He not only found a land touched with a history of thousands of years, but also an ethnic whirlpool of musical styles, rythms, and melodies. He has spent years absorbing and interpreting the musicof the east,captivated by its rush of eastern rythms and fragrance of ancient melodic spices. 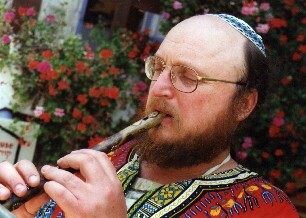 He is not only known in Israel as a master of the clarinet, but a modern day troubadour, bringing a wide variety of musical instruments from around the world to the Israeli stage. His flamboyant style affects not only theatre goers, but serious musicians as well. His talent even goes beyond the ability to adapt to cross cutural texture in music. He is also an accomplished musical instrument maker, custom designing and making flutes, chimes and brass instruments inspired from his hands-on approach to world music. In an age of elaborate technology, the world is overwhelmed with an abundance of communications between different cultures and lands, language and art. Music over and over again seems to strenghten the ties between people on this incredible planet. David's hope is that he can be a part of this enriched communication by introducing you to his music. We are giving you the opportunity here to listen to exerpts and to purchase two CD's of David Perkin's music. These are New Sounds from Jerusalem and Israeli Klezmer King. Purchase these albums on CD for $22.00 or cassette for $13.00, including shipping worldwide. Click here to hear a medley from this CD on Real Audio. If you do not have the Real Audio RealPlayer player, you can download it from here.